The Tehran Initiative. . .WOW!!! 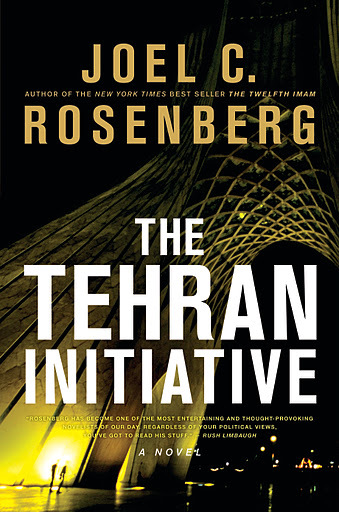 Author Joel Rosenberg is a master of intrigue and suspense and has another winner with his latest novel, The Tehran Initiative. Right from the start this book draws you in and you won’t want to put it down. A bold assassination plan is launched in the opening chapters of The Tehran Initiative. CIA Agent David Shirazi is a dutiful son is standing by his mother’s sickbed when duty calls. The President of the United States, the Prime Minister of Israel and the President of Egypt are attacked in New York City. Within hours, David is headed back to Iran to see if he can find out who was responsible for this deadly terrorist attack on American soil. Can war be averted as the Twelfth Imam continues to persuade Islamic countries to join his Caliphate? Should nuclear weapons be entrusted to the self-proclaimed Islamic messiah who has genocidal plans against Israel? Will the United States stand behind their ally and the only democratic government in the Middle East? Will America and the world wake up before it’s too late? Will they? Well, you’ll need to read the book to find out! Joel is an excellent writer, skillfully weaving current Middle East events with Christian biblical prophecy and Islamic eschatology. There were a couple of times when current news events closely resembled scenes in the book. (That was kind of eerie.) Joel does a good job in developing the characters and giving you an understanding of who they are and what motivates them. I enthusiastically recommend this book, both for the Joel Rosenberg fans and the person who hasn’t yet read one of his novels. This book stands well on its own or as an exciting and welcomed addition in the continuing series by Joel Rosenberg. FTC Disclosure: I received The Tehran Initiative for free as part of the Tyndale Publisher book blogger program. I was not required to write a positive review. All opinions expressed in this review are my own. 1) This is the second book with CIA operative David Shirazi. Where does the story pick up from your previous bestseller The Twelfth Imam? A: The Tehran Initiative begins about sixty seconds after The Twelfth Imam leaves off. I’ve tried to create a near seamless connection between the two. And there’s another book coming, The Damascus Countdown. 2) You started writing The Tehran Initiative when the Arab Spring began earlier this year. Did events impact your writing or the storyline? A: Actually, I was well into writing The Tehran Initiative when the “Arab Spring” began and it was a little eerie because the novel opens with the assassination of the President Egypt and Egypt descending into chaos after the leader’s fall. Fortunately, Egyptian President Hosni Mubarak wasn’t killed, but he certainly fell quickly and somewhat unexpectedly and Egypt is still reeling from the aftermath. The novel really focuses a great deal on the intense desire amongst many Muslims in the Middle East and North Africa to build a global Islamic empire, or a “caliphate.” And that’s certainly a growing theme among the Islamists in the region this year. Perhaps what struck me most curious since the publication of The Twelfth Imam and while I was researching and writing The Tehran Initiative is that the so-called Supreme Leader of Iran, the Ayatollah Ali Khamenei, has began speaking more publicly about the coming of the Twelfth Imam. He used to be silent, or nearly so, on this subject. He let President Ahmadinejad do all the public talking about Shia End Times theology. But Khamenei has become more bold over the past year or so. He has told people that he has met personally with the Twelfth Imam, though we don’t know what he meant. Did he meet with a flesh and blood person? Did he see a dream? Or a vision? We don’t know. But Khamenei has also asserted that he is the personal representative on earth of the Twelfth Imam, as well as the so-called Prophet Muhammad. These developments – along with his support for Iran’s aggressive nuclear development program – suggest Khamenei senses the time is very short before some claiming to be the Twelfth Imam emerges publicly. In part, that’s why the Iranian government released the pseudo-documentary film in early 2011 called, “The Coming Is Near,” about all the geopolitical signs that they believe are indicators that the Mahdi’s arrival is increasingly close at hand. Whether it will really happen or not remains to be seen. But the Iranian leadership is certainly convinced. Most of them, anyway. And, of course, the Bible tells us in Matthew chapter twenty-four to expect false prophets and false messiahs in the last days. So we can’t rule out the possibility that we’ll actually as false messiah emerge from the Shia world. 3) You’ve earned a reputation of writing stories that seemed ripped from tomorrow’s headlines. What is going on in The Tehran Initiative that we can see unfolding in the news? A: I think the biggest parallel between The Tehran Initiative and current events is the growing sense amongst Shia Muslim leaders – particularly in Iran – that the Twelfth Imam is coming any moment, coupled with Iran’s feverish efforts to build nuclear weapons, and the Israelis’ growing isolation in the world and feeling that they may have to hit Iran all by themselves. Did you see Iranian President Mahmoud Ahmadinejad’s apocalyptic address at the U.N. in September, or read the full text? You should. It’s instructive. Ahmadinejad is not a world leader worthy of the world stage. He is the evil leader of an Iranian death cult. A recent U.N. report indicates he is making progress in building nuclear weapons. He is calling for the arrival of the Twelfth Imam and wiping Israel “off the map.” He aspires to be a mass murderer beyond the scale of Adolf Hitler. He deserves to be in prison, or an insane asylum. His U.N. speech was further proof, if more was needed. Israeli Prime Minister Benjamin Netanyahu understands what Ahmadinejad means. So do some of his top military advisors. That’s why they believe Iran is in the eye of a gathering storm in the Middle East, and that the chance of a major war is growing. To me, all this feels ripped from the pages of The Tehran Initiative. Unfortunately, it’s all true. 4) Readers seem to get very attached to your characters. What goes into creating the characters in your novels? A: It’s the Colonel’s secret recipe of seven herbs and spices. I could tell you, but then I’d have to….well, never mind….no comment to that one. 5) What experiences in your real life do you draw from to piece together these novels that incorporate geo-politics, espionage, romance, and Bible prophecy? A: Someone once told me, “Write where you live in your head.” For some reason, that advice resonated with me and stuck. I’m fascinated with politics, prophecy and the Middle East. Living in Washington, D.C. and working in and around the political world for the past two decades has certainly helped provide context for me to write political thrillers. I think traveling extensively throughout the Middle East and North Africa has been helpful, too. Somehow, it’s all worked together in a way some people find as interesting as I do. 6) You often incorporate Old Testament prophecy in your books. What scriptures do you draw from for this book and why? A: There’s no question that I am absolutely intrigued by Bible prophecy, and I like to start with an End Times prophecy – or a group of last days prophecies – and ask, “What if these were to happen in my lifetime? What would it look like? What would it feel like? How might such prophecies realistically be set into motion, and what might be the implications of their fulfillment?” That’s how I approach writing these books. But I don’t think of it like writing a fantasy novel or science fiction. I’m genuinely trying to imagine how it could really play out? I’m not saying these prophecies will necessarily come to pass the way I envision them, but they are interest to war game and see what happens. And given what’s happening in the real world today, I think readers are as curious as I am, and somehow my plots don’t feel that far-fetched. 7) You’ve been successful with your non-fiction books Epicenter and Inside the Revolution and you have a large following reading your analysis of Middle East events on your blog and e-newsletter “Flash Traffic.” Why do you continue to choose writing novels about the Middle East? A: What could be more interesting? Presidents and presidential candidates constantly focus on the Middle East. Prime Ministers do. Kings do. Generals do. The media does. The economists do. The fact is, the eyes of the nations are riveted on Israel and her neighbors, the epicenter of the momentous events that are shaking our world and shaping our future. The stakes are very high. There is lots of uncertainty. It’s mysterious and dangerous and complex – it has all the elements of riveting political thrillers. And the Bible says the Middle East will become even more dramatic until the very return of Jesus Christ. Why write about anything else?